No, really it is Beyond the scent. 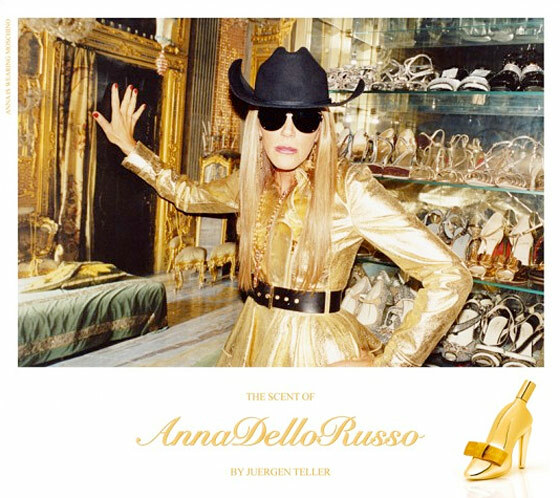 Anna dello Russo can do no wrong and this time she gives us her scent. And it is "Beyond", that's the name of her scent which will be available on yoox.com come December 3, 2010. The perfume comes in a golden shoe bottle. Cute yet fragile, it seems that the bottle is made up of a thin sheet of glass and is hand made/blown. 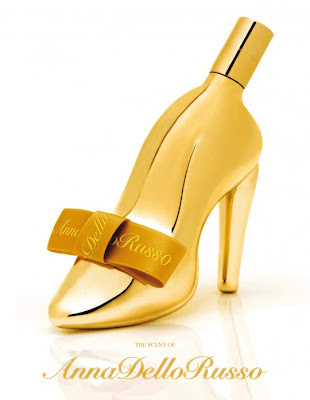 This is the perfume made for your dreams. EVANESCENT, GLASSY, FRAGILE. her words not mine. The photo above is taken by renowned fashion photographer Juergen Teller. Here is a photo of the bottle in its golden glory. And a video promo. Shot in her apartment/closet in Milan, Anna walks around in white gowns from Pucci and Roberto Cavalli with head dresses by Alan Journo. And a long list of credits. Plus a glimpse on how the shoe is being made, well, not really. Just watch it.